Are you eager to invest in Facebook ads but worried you won’t get a good return on your investment? Would you like to decrease your ad spending and increase your ROI at the same time? In this case study, we’ll show you how The Advisor Coach optimized his Facebook ad campaigns using OptinMonster’s responsive optins. 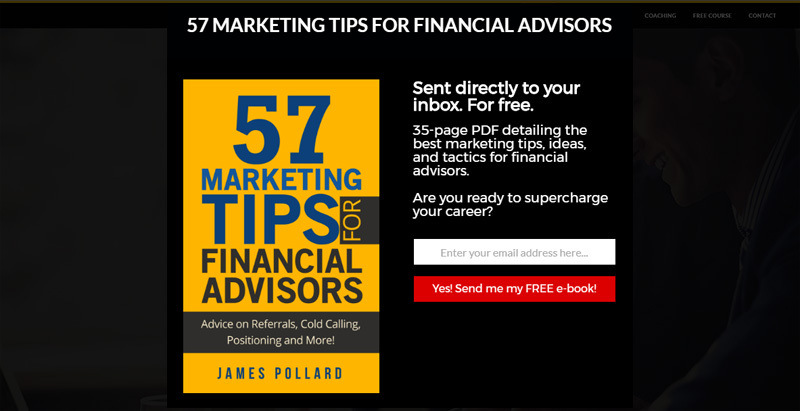 James Pollard from The Advisor Coach offers marketing and consulting services for financial advisors. In addition to free courses and paid products, he also offers private coaching for financial advisors. He sat down with us to tell us how OptinMonster has increased his bottom line. James uses Facebook ads to help drive traffic to his website. By targeting and retargeting his ideal customers on Facebook, he ensures his message is seen. Prior to using OptinMonster, his most successful optin converted only 1% of his readers. James hoped to improve his Facebook ads ROI by using OptinMonster’s responsive optins. Knowing that Facebook ad clicks from mobile users are less expensive than desktop users, James optimized the ad spend by targeting these mobile users. If his traffic was coming from mobile devices, his optins needed to look great on mobile devices, too. OptinMonster offers mobile-specific optins that are designed to perform best on mobile devices. However, we also offer several other responsive optin types that also look great and perform well on phones and tablets. James started by adding a floating bar optin at the top of all his blog posts. By default, this optin type shows only to desktop users, but can also be targeted to mobile users specifically. This optin converts around 1.8% of readers – almost doubling his conversion rate from before he used OptinMonster. Next, he added an inline optin at the bottom of the posts with the same offer. Our inline optins are also just one of our responsive optins, and look great on any device. It converts around 1.86% of readers. On some specific pages, the optin rates for these optins increase to 3% and even 6%! Floating bars and after-entry/inline optins are two of the least intrusive optins available. While they perform consistently, they are not typically high converting optins. After seeing success with the two optins above, James decided to add more aggressive responsive optins to his site. He added a full screen optin with the same offer and saw a huge increase in conversions. This optin converts 58.33% of readers. These campaigns are a great example of how to make the same offer multiple times without annoying readers. By repeating the offer, James gives his readers three opportunities to make a decision about it instead of just one. Drawing on his success, James began adding optins for other lead magnets throughout his site. 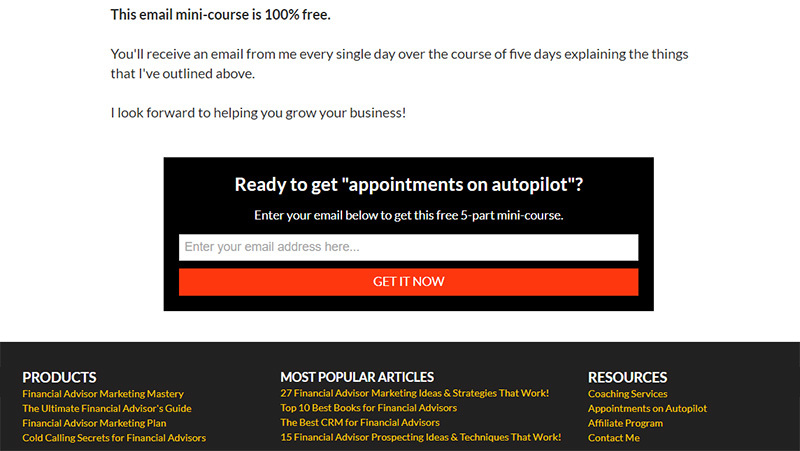 Using an inline optin again, James created a landing page for a course on attracting clients. A landing page is a web page created as a destination for visitors to your website to get information about a particular offer or resource that’s relevant to them. This optin converts a whopping 53.47% of readers! Inline optins can be added directly to the content of any page of your site, turning any page into a landing page. This means you don’t need additional landing page software like Clickfunnels or LeadPages just to create a landing page. The Advisor Coach tried several different optin types, each type increasing their conversions. 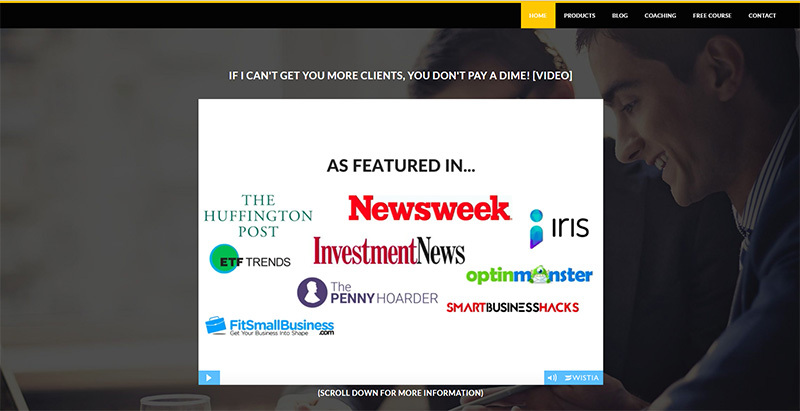 The Advisor Coach converted 1.6% of readers using floating bar optins. The Advisor Coach converted 58% of readers using fullscreen optins. The Advisor Coach increased conversions 360% of readers using inline optins. Different optin types convert better than others because of how they catch your readers attention. You can further increase those conversions by making the offers presented in your optins as targeted and specific as possible. I have sold more products and services because I’ve been able to increase the amount of people on my list. My email funnel does a lot of the hard work for me, so as long as I get people to enter their email address, they will eventually get to know me and understand what I do. Going from 1% optins to 3% optins (and more) has definitely had a major impact on my bottom line.